The Benewah Milk just off I-90 is an unmistakable downtown Spokane landmark. It is one of two Milk Bottle buildings in Spokane: one on Garland Avenue (built in 1934), and another on Cedar Street (the Benewah Milk Bottle, built in 1935). 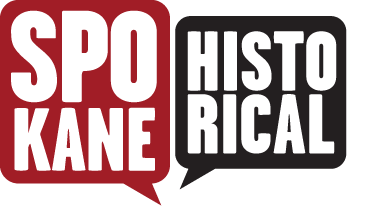 The buildings were designed by famed Spokane architectural firm Whitehouse and Price, who were responsible for many other buildings in Spokane including the Hutton Settlement, the Rosebush House, and the John A. Finch Memorial Nurses Home. 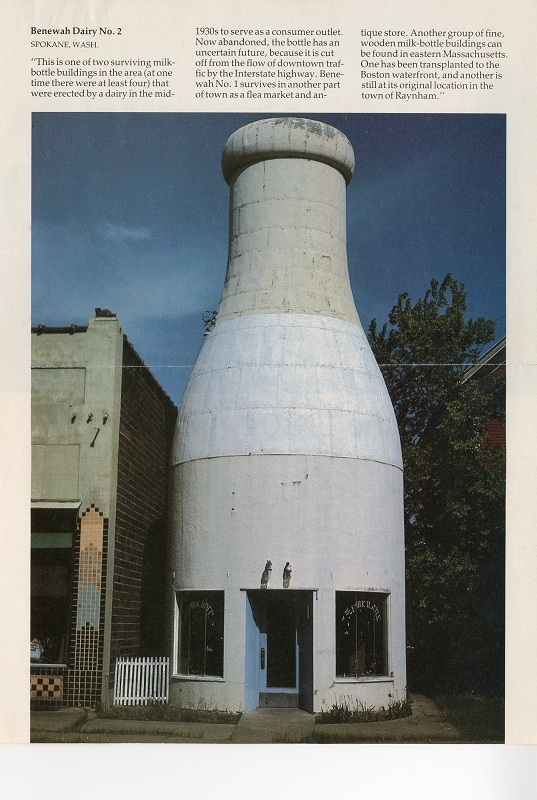 The Milk Bottle is a remarkable example of "mimetic" or literalist architecture, which seeks to combine form and function, allowing the building itself to become its own best advertisement. The Benewah Milk Bottle was the home of the Benewah Creamery Company, where Newport sold dairy products distributed from his processing plant on 1st Street and Washington Avenue. The owner initially planned to build six of these iconic outlets - at a whopping $3,700 each - but only completed the stores on Garland and Cedar. Newport never specified the reason why he scrapped plans for the other four Bottles, but the Depression-Era economy (which had a profound impact on local farms and dairies) is likely to blame. The Bottles functioned as concession stands to lower prices by "eliminating charge accounts and delivery service (except on large orders)." Newport ran a retail operation from the Milk Bottle until 1978, and since then the building has served many purposes, few of which have had anything to do with dairy products. Interestingly, it has even been the home of the Spokane County Democratic Committee. Fascination with this building has never waned. The Milk Bottle was nominated to the National Registry of Historic places in 1985, and it continues to be a favorite attraction. In fact, Time.com listed it as one of the top fifty American Roadside Attractions in 2010, and numerous other websites include it as a must-see sight while driving through Spokane (especially since it's visible from the freeway). The easily-accessible location also makes the Milk Bottle a popular walk-by destination. 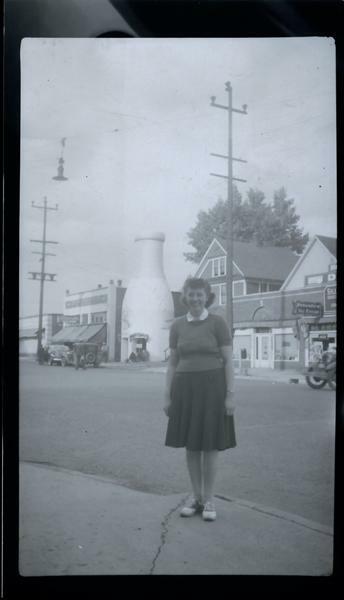 Although the store on Garland was badly damaged in a fire in 2011 and has subsequently been restored, the Benewah Milk Bottle is still in good shape after seventy seven years. Benewah Milk Bottle, 1985: The Benewah Milk Bottle as it looked in 1985 (Spokane Public Library, Northwest Room). Benewah Milk Bottle (Pre-I90): The Benewah Milk Bottle as it would have look in the decade or so after its construction. Note how much the interstate changed the neighborhood (courtesy of Larry Cebula, Northwest History). 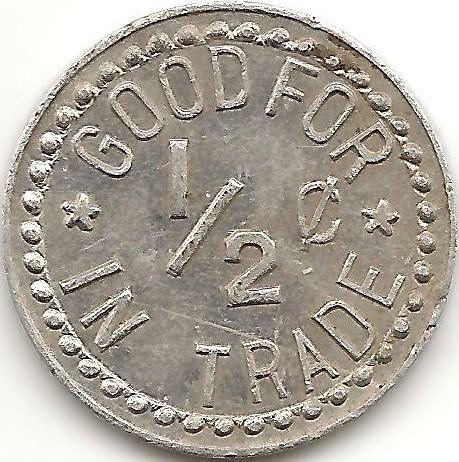 Benewah Creamery Token: Alternate scrip use became more common during the Great Depression because of instability in the banking industry. This token was worth 1/2 in trade for Benewah Creamery purchases. 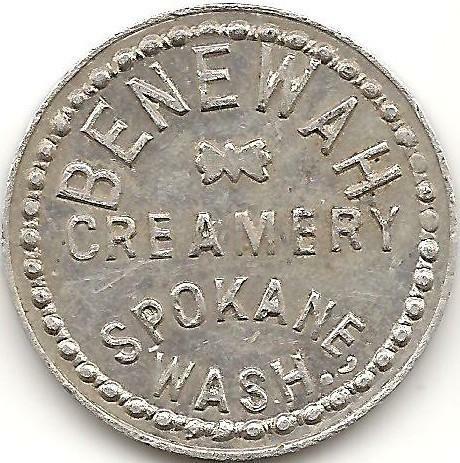 Benewah Creamery Coin (Reverse Side): This particular token was worth 1/2 cent toward Benewah Creamery purchases. 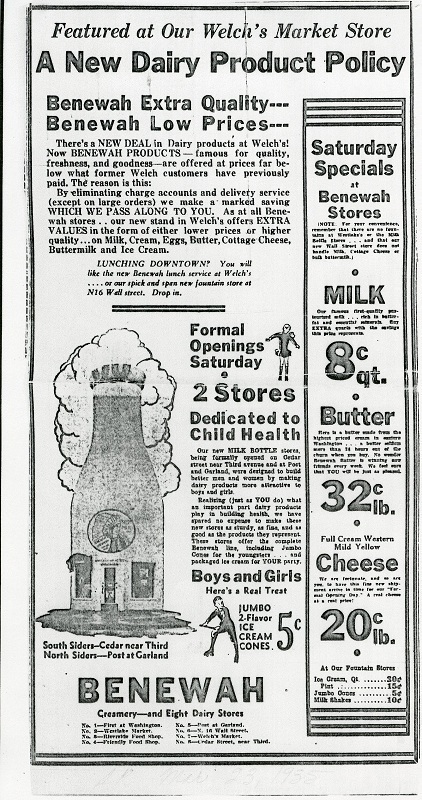 "A New Dairy Product Policy": 1934 Advertisement for the formal opening of the Milk Bottle stores "dedicated to child health" (Spokane Public Library, Northwest Room). 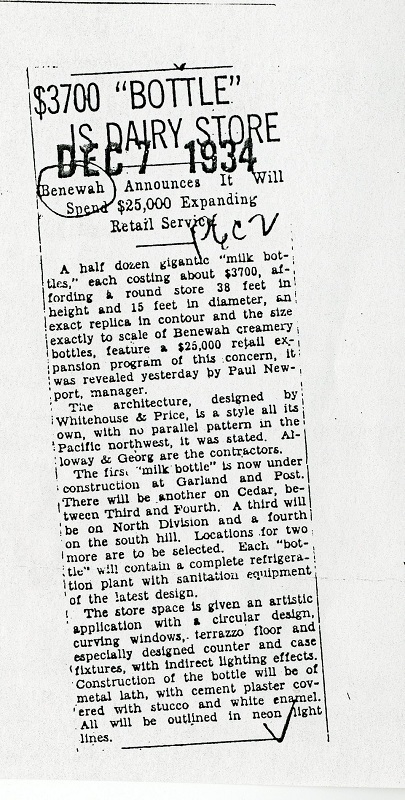 "$3700 'Bottle' is Dairy Store": 1934 Spokesman-Review article announcing the construction of the first Milk Bottle (Garland Street) with plans to construct six more (Spokane Public Library, Northwest Room). Frank Oesterheld, “The Benewah Milk Bottle,” Spokane Historical, accessed April 19, 2019, https://spokanehistorical.org/items/show/295.